Discussion in 'Transfer Forum' started by Red Indian Chief Torn Rubber, Dec 18, 2018. I am not following anyone of you guys tbh. But it might be that I am not familiar with UK tax law. When you are discussing net and gross income/salaries its the income tax you are referring to, right? Because that is at least how I have been taught to use those terms. Is there not an applicable pay roll tax in the UK as well? In Sweden thats 31.42 percent, even if I know we are in the extreme. Total cost for the club: 200k * 1,3142 (using Swedish pay roll tax) = 262,84k per week total cost for the club. Because many players ply an international trade they don't care about local tax laws so they negotiate a net salary. It's up to club to calculate the total gross salary and work out if it's affordable for them or not. Sometimes players are paid in a foreign currency as well, like players playing in Qatar etc. often have their contracts negotiated in net US dollar terms, so they don't have to worry about shifting exchange rates. Too much money by what measure? Like I explained £10m net per year to the player and £25m sign-on fee works out at about the cost of Fred. Probably less in fact, since Fred would have picked up a sign-on fee on top of the £52m transfer fee and it's widely reported he's on a 6-figure weekly salary. How does it make sense to be happy to give the money to another club but be reluctant to give it to another player? If anything it makes the deal easier as you have 1 less party to negotiate with. Depends on length of contract. If we sign him for 10 million net then it's 19 million gross. If we sign him for 5 years then total cost would be 19*5 + 25 = 120 million for 5 years. Fred was signed for 50 million so obviously his signing on fee would be lot less. Fred should earn 230K per week and 10 million signing on fee to cost 120 million for 5 years. There was no exact logic to my example using 45% other than a quick google of what footballers pay in tax. It probably is more or less given difference charges and credits. Yeah, I understand that. But if that is how you guys are reasoning it would mean that you appreciate pay roll tax and income tax together in the GB at just 45 percent. If you see my Swedish example it would be like 120 percent or something. That was my major reaction that I did not understand. But maybe the GB really is a tax haven compared to other European countries. Very true, 4+1 versus 5+1 makes quite a difference in this case. Worth noting that the reported 10m net is in Euros not GBP, while Fred's fee and salary is reported in GBP. 19m Euros is under 16.7m GBP atm, makes quite a difference overall. If it's a 4 year contract it works out as 16.7*4 + 25 = £91m. Fred was £52m rising with an undisclosed sign on fee. If he's anywhere near £150k then he breaks about even on a 4-year duration, but appears significantly cheaper on 5 years duration. I plucked the 25m out of my arse to be fair, we don't have any rumours of sign on fee demands beyond the alleged 10m net salary. He might be happy with a significantly smaller fee given the size of the salary demanded, who knows. All i was saying is that even if he demanded a 25m sign on fee on top of 10m euros net salary, it still wouldn't be an outrageous demand for the player. There's no such thing as payroll tax in the UK. I'm not even sure what that represents. We have income tax and National Insurance and that's all that comes out of your payroll. NI tax marginal is only 2% on anything above a grand a week. So at worse you can say 45% + 2% = 47%. The calculations above (19m gross for a 10m net) are largely correct and probably erring on the side of caution if anything. I'd be extremely surprised if these footballers paid full tax and were not on some legal loopholes to minimise it. It sounds like a lot of money to give for a sign-on bonus on top of huge wages, I told you this already. I'm assuming those £30million would also be subject of tax laws as well, right? Add another 7 million on that and that's how much Salah was paid. Also Rabiot himself is demanding £10 million as a sign-on fee on top of the £10 million in wages and since he's camp is considered by many as quite demanding, it gives the idea that those £10 million is one of the bigger sign-on fee's. By default you turn to free agent big talent in order to avoid paying high transfer fee's. Yeah, all based on assumptions. If we sign him good, wages and overall finance is taken care by experts. All I care is we are adding good player. OK, thanks, then I understand what you are saying. I am not going into what payroll tax is in this thread, its way too OT. I know what you are talking about, it's the same here. It used to be a debate in France about how it's impossible to compete with the PL. Like you said earlier a player that has a 19m gross salary will in fact cost 25m to his club. "Sounds like a lot" is not rationalising it mate. I don't know what the precedence is for the tax payable of the sign on bonus fees. I thought like the one-off transfer fees, the tax payable is by the recipient not the club paying it. One-off fees can be paid as "consultancy fees" to independent companies based in tax heavens for a start. Your idea of turning to free agents to avoid transfer fees is more outdated than the Nokia 3210. Especially when it comes to young players that get tied to 5-year long contracts, instead of 35yo players on 1 + 1 year contracts. You already have one bonus which is only having to negotiate with one side (the player) versus two (player and club). Any cost savings is a bonus on top of that, they don't have to be significant. As you've seen in the cases of Sanchez and now Ramsey players stand to receive very close to what their previous club would get if they sold them, as part of their total package renumeration. 10m one-off and 17m gross per year is ~95m for 5 years. It's a lot, but it's far from outrageous. It's the equivalent of a £55m fee and £150k salary. For a France international and PSG player. We're at the era of 70m Kepas, 70m VVDs and 60m Moratas. Could be a good signing, but if he throws his toys out of the pram when he doesn't get what he wants at United, could be a bit disruptive. He has done this with PSG and the nationalteam already. "Sounds like a lot" is not rationalising it mate. I don't know what the precedence is for the tax payable of the sign on bonus fees. I thought like the one off transfer fees, the tax payable is by the recipient not the club paying it. You're obviously ignoring the parts in which I'm telling you why I think it's a lot to give as a sign-on bonus, but you're too preoccupied with making some pety remarks like that Nokia one. Raboit is not playing for France NT and he won't be for the foreseeable future and you're also forgetting the agent bonus, which if player is to get £30m as a sign-on bonus, gotta be quite substantial on top of the tax on those £30 million irrelevant of who's paying that tax, because player might ask for £30 million after the tax. So then you have sign-on bonus + tax, agent fee + tax, annual salary + tax, which all combined makes it look as if you paid the full transfer fee which then negare the whole purpose of signing a free agent - is to get a player on the much lower price. If clubs were handing out huge sign on bonuses, we would have shiitload of players running down their contracts so that they could get a huge sign-on bonus on top of a huge salary. Yeah, its like that in most Northern European countries. I was surprised to hear that the UK applies a more "latin" taxation system, but then I understand what the original posters meant. And thats why asked my original question. There are so many different taxation systems even within the EU though, and different ways to report salaries that it makes a lot of these figures floating around in tabloids of different countries impossible to compare. What should be reported as a rule (never going to happen) should be the total cost for the club over the term of the contract in salary (sign-on fees are treated more or less as salary in most jurisdictions so including this if applicable). That would make it somewhat comparable from country to country, now its just a mess. It all comes down to the total cost for the club in the end. Transfer fees are not really relevant in this respect btw. @MadMike you can also find articles where it says that Barcelona deeming Rabiot's demanded sign-on fee of £10 million, too much, which is the stepping stone which is preventing the 2 sides to make a deal. And if Barcelona who at that point needed a quality MF deemed that too much even for a highly talented free agent, it's safe to assume that those £10 million he's asking is quite a lot when it comes to a sign-on fees. But isnt that exactly what is happening? Its a perfectly normal consequence when the transfer market and the wage market are not correlated. The transfer fees are to high compared to the wages being paid right now after the last couple of years inflation in the transfer market. And its normal that this correlation takes two or three years because of the length of most players contracts. Its going to be worse this coming summer with Eriksen. Hazard, De Gea entering into their last years. So I dont really get your point. Exactly, there is no reason for players to let everyone increase their revenue while their wage stay relatively consistent. Players should sign shorter contracts and milk the heck out of clubs who saw their revenues increase massively. OK I admit I may have exaggerated with that particular part. But I guess those you've mentioned can be explained depending on the context . For example Hazard wants that move to Madrid, it's his "dream club" and since Madrid won't pay exuberant amount Chelsea are asking, running down his contract might be the only way he goes to Madrid. Eriksen was always a target for top clubs and I assume he wants to win big trophies, something he cannot do with the Spurs, also since Levy is the world's toughest negotiator, running down his contact might be the only way he gets the move. DDG is already the world's best paid GK I believe he wants some assurances that we won't have another Moyes/LVG/Mourinho scenario before he re-signs. You're a little bit crazy, I'll give you that. You at no point explained why you thought it's too much, merely that you thought it was. Yet now you're telling me that you explained it, but I'm not paying attention. Riiight. Then you say that who pays the tax is irrelevant but you proceed to quote a bunch of one-off fees and adding "+ tax" as extra... because tax irrelevant? No sense. The club doesn't pay the tax on one-off fees, never did. Agents pay their own personal and corporate tax and their companies are often listed in offshore tax havens to minimise their exposure. They are not employees of the club. Fees paid to other clubs also don't incur tax, it's part of the club's P+L, they'll pay tax on their profits at the end of the year. Sign-on fees are also one-of payments usually to 3rd party companies that also don't incur tax. The clubs only pay the tax of their employees for recurring payments stipulated in the employment contract. And obviously your last statement shows you're even more out of date than the aforementioned Nokia. That's precisely what players are doing, running down their contracts to get big money. It's been a theme for a while now. The club doesn't pay the tax on one-off fees, never did. Agents pay their own tax and their companies are often listed in offshore tax havens to minimise their exposure. They are not employees of the club. Fees paid to other clubs also don't incur tax, it's part of the club's P+L, they'll pay tax on their profits at the end of the year. Sign-on fees are also one-of payments usually to 3rd party companies that also don't incur tax. The clubs only pay the tax of their employees for recurring payments stipulated in the employment contract. This is getting way off-topic but since I am a labor law lawyer dabbling in sports law as well this peaked my curiousity. Are you saying that in the UK a football club does not pay the same tax on a sign on fee paid to a player as they would on a regular wage payment? That would constitute tax fraud in Sweden and in most other European jurisdictions that I know of. Any compensation tied to your employment would need to be taxed as income. And if this really is the case why pay any "wages" at all? Just call everything sign-on fee or art least the absolute part of it. I get the other part of your post and agree with it in general. But can that really be correct? I would add to this also that sign-on fees today very seldom are one-off payments anymore. They are being paid over the term of the contract. For many different reasons. But one simple example. Barcelona fecked up with this with the Neymar-deal and got screwed. He took an absurd amount of money and left anyways shortly after. That's a bit rich when you provided absolutely nothing while I told you when he did it. Between 2014 and 2016 Rabiot played on the right a fair amount of time, Matuidi has been tried there but he isn't good at all. Rabiot played all midfield positions for PSG because he was the fourth midfielder, the one replacing Motta, Matuidi or Verratti. When he is fit Verratti will always play on the right because it's his position which means that Rabiot will compete for one of the other role, it has nothing to do with an inability to do it. 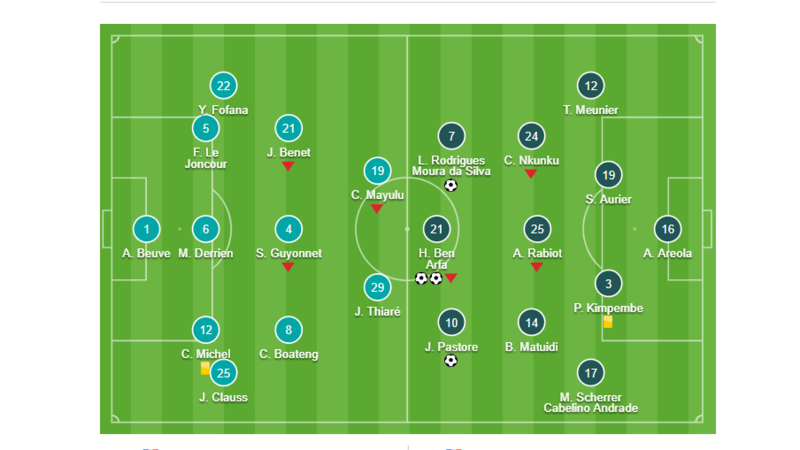 Also when Verratti wasn't playing there was only left footed players in that midfield. Provided nothing, eh? You are the one who tried to prove me wrong, why should I provide the proof first? First video is "unavailable". Second video, All I see he played majority in that clip on the left and a few of them came from central. Besides, I don't remember I ever said that a left foot midfielder can't play on the right have I? All I said is that "I don't fancy a left foot midfielder to play on the right" (Quote on someone who posted Rabiot - Matic Pogba). Let's please don't ignore this point by saying I don't have one and you start making things up now. This is where both Rabiot & Matuidi played when Veratti not on the field. I'm not an expert on tax myself, but it depends on whether the payment is to the person (individual) or a limited company. Whether it's stipulated as part of the employment contract or it's a separate payment. Players can have limited companies that you can make a one-off payments to as a "consultation fee" and then the company is liable for declaring and paying the tax. Generally that's also how contractors are paid, but you can't be contractor at a place for too long before the tax office comes quizzing you. One-off payments before start of employment are usually quite easy to separate from salaries in that regard. If the sign-on fee is amortised over a period spanning the employment then the taxman could well consider it part of the salary and see it as an attempt to tax avoid. Saul played on the left side as LCM most of the times. If you meant playing on the right side wide midfielder that's different. Benardo has been playing most of his career in advanced role on the right side, that's natural to him when he moved to central area. You can find tons of left foot players being forced to play as RCM due to injuries. But rarely we see a left foot one plays as RCM with right foot one plays as LCM in same XI. OK, thanks for the reply. You seem to have a very "flexible" taxation system in the UK. Good for you I guess. In Sweden it would never work. You cant be an employee and a contractor at the same time if its obviously tied to the same work. Even if you pay money before the actual employment starts. And there is EU-legislation and case law clearly defining the difference between employee and contractor and there is no way a professional footballer could ever be a contractor. For many reasons. Paying for anything except image rights to a third party would also be a big no-no. Even if you call it consultation fee, the taxman would just say feck you in Sweden. We are not buying that. It would also probably break the rules on third-party ownership that FIFA/UEFA has stipulated. That said, I agree with what with you said about clubs trying to apply new brilliant solutions to cases like Rabiot. How on earth City has not been charged with how they have paid their managers like Pep - what obviously is salary - with consultancy fees from the middle-east, I will never understand. So you used a cup game against the US Avranches(third division) where two starters, Verratti and Motta, are rested to make a point about Rabiot not playing on the right. Out of these three players Rabiot is the only one able to replace Motta which is something that I already told you, he played in all three positions. I wonder how much digging was required to find a game of Avranches, also watch the second video one more time. Fellaini is gone, McTomonay is with the u23 squad now, Fred has failed to spark here and Pereira is a major doubt. We need a midfielder in the summer quite badly, we can’t play the same 3 all the time. He’d fit the bill, I reckon, football wise. If we wrote players off after a poor first season then Lindelof, Shaw, De Gea, Pogba, Herrera etc would have been sold by now. Fred deserves a chance to come good next season and I think he will. In saying that Rabiot would be great but I think we'd be too weak defensively with himself and Pogba in a midfield 3 together. It would be awesome to have him for rotational purposes but the risk is the monster tantrums he might throw if benched for big games. I thought his best performances were at DM covering for Motta. That he’s not weak defensively, the opposite, just that he doesn’t want to play the defensive role. I think describing a midfield 3 with a dedicated DM (be it Herrera or Matic) as too weak defensively is a bit crazy to start off with. Never mind when the 2 CMs are players like Pogba or Rabiot who are not passengers like Ozil but strong runners who are quite keen to get stuck in and win the ball back. I’m not writing Fred off btw, but we definitely think we need to add. We have too many players who can’t be relied upon atm. He’s nowhere near good enough at football for the hassle his terrible attitude brings to the table to be worth it. Big fat pass from me. Is there really that much hassle with him? PSG seemed quite desperate to keep. He just seems a bit strange. I’m sure someone will talk to Martial and Pogba before signing him. Would assume they know him quite well. "you, you, you, you" hm okay. As expected you completely disregarded all the points I was making and you're either unable or unwilling to understand the multiple explanation I gave you like that one where it's actually stated that Barcelona deemed his demanded sign-on bonus to be too high, but hey you just keep patting yourself on the back. Hypothetically, if a player wants, a £30 million sign-on bonus after taxes, than obviously it's the club that will be the one paying taxes in the end because they gonna pay the player enough money for him to be left with £30 million after taxes. I don't think any more can be said really. We're at complete breakdown of communication. Let's leave it and move on. I had the exact same experience with this guy in another discussion. Strikingly similar type of discussion where he claimed that I was unable to understand his arguments (just like in this case, they did not exist). Time waste! Was it the one where you couldn't understand I said we need an improvement on the RW position in general, a proper right winger, instead you were focusing how Lingard was operating all over the front line against Leicester (something I also pointed at)? This comment of yours kinda sends the message of you being desperate to jump on anyone disagreeing with me to pat them on the back, looks like you were a bit hurt. When a player is able to say "No, I don't want to be a substitute for the national team, I just want to be picked and I will reject the role even if it means I may not come back into the national team myself!". When you have a player with such state of mind, you should never hire him at all cost, he's just trouble, let him do that **** in another club. Hehe, no that was not the case and if anyone is interested in the discussion it will be easy for them to find it. That is good enough for me! Did not Carrick and Carragher do something similar towarda the end of their carriers? Maybe even Scholes. Rabiot might have been a bit more childish about it, but he was/is young too! Exactly, discussion is there for everyone to see. I don’t see why you are having issue of me using cup games while you used Veratti’s injury as an excuse for the manager had no other choice but to play him on the right side. That’s my question so what about it? I don’t remember I make statement he can’t. My statement was I don’t fancy him on the right side. Again, you misunderstood somethinghere, playing across in midfield area as LM, RM, DM & CM is different to playing on either RCM or LCM. Gabi, Partey & Rodi played on the right side not Saúl. I never say they can’t play there, I just don’t fancy them playing there if there is a right foot one. You won’t see Pep decides to put KDB on the left just because he can use both feet and use Silva on the right instead.